High Grade Drilling Results Continue at Kat Gap. Perth, Dec 12, 2018 AEST (ABN Newswire) - WA-focused gold exploration and development company Classic Minerals Limited ( ASX:CLZ) ("Classic", or "the Company") is pleased to announce that it has received assays results from its recent RC drilling program at its Forrestania Gold Project (FGP) in Western Australia. The Company completed a total of 23 holes for 1,155m at the Kat Gap project with the aim of improving/increasing known high-grade gold mineralisation. - RC drilling at Kat Gap conducted over 200m of strike focused mainly on shallow up-dip testing of recent high-grade intercepts along with strike extensions to the north. System remains open in all directions. - High grades and shallow nature of the gold mineralised system will enhance the economics of any future open pit mining operation. Drilling results from Kat Gap continued to impress with significant zones of gold mineralisation located on the granite-greenstone contact. Recent drilling at Kat Gap also showed that high-grade gold mineralisation projects very close to surface. The Forrestania Gold Project just keeps on getting better and better delivering more great results for Classic and its shareholders. I'm very excited about these shallow high-grade zones of mineralisation we have encountered. They clearly demonstrate that significant gold mineralisation is located just beneath the surface. If these shallow high-grade zones continue along strike for several hundreds of metres, they will have a major impact on the economics of any future open pit mining operation. The next stage for Kat Gap is to commence an aggressive RC drilling program extending the known mineralised zone north and south from our current drilling area. The plan is to focus our attention on an 800m long section of the main granite-greenstone contact where existing historical drilling is on 100m spaced lines. Our current drilling area sits right in the middle of this 800m long section. We are of the firm belief that significant gold mineralisation is lurking between these lines similar to what we have seen during the last 4 drilling programs This work should give us a pretty good idea of how good this system really is. A few deep diamond holes will also be incorporated into the program to probe at depth 200-300m below existing drill coverage. If we start seeing significant zones of gold mineralisation in these holes then the game is on. Classic drilled 23 holes for 1155m at Kat Gap and is pleased to confirm that 18 holes returned gold mineralisation striking in a northwest-southeast direction. The drilling has now extended the strike coverage to 200m with mineralisation open in all directions. The majority of the drilling was focused on testing the up-dip projection of recent high-grade gold intersections along the main granite-greenstone contact adjacent to the cross-cutting Proterozoic dyke. A few holes were also drilled 60m further along strike to the north following up on previous historical RAB and RC holes. Drill holes FKGRC035- FKGRC050 and FKGRC054 (inclusive), all tested the up-dip projection of the main contact lode. Holes FKGRC051 and FKGRC055-FKGRC057 were drilled north along strike. Better results from the shallow holes included: 3m @ 38.33 g/t Au from 21m including 1m @ 111.00 g/t Au from 22m in FKGRC039; 5m @ 5.61 g/t Au from 6m including 1m @ 12.00 g/t Au from 8m in FKGRC040; 2m @ 7.86 g/t Au from 19m in FKGRC041; 3m @ 14.10 g/t Au from 10m including 1m @ 37.40 g/t Au from 11m in FKGRC042 and 3m @ 9.64 g/t Au from 20m including 1m @ 25.10 g/t Au from 22m in FKGRC043. Holes FKGRC051 and FKGRC055-FKGRC057 were drilled along strike to the north testing the extent of the main granite-greenstone contact lode. All holes intersected gold mineralisation with the best result of 5m @ 4.07 g/t Au from 66m including 1m @ 11.50 g/t Au from 69m coming from FKGRC051. The next closest historical RC hole is some 100m further along strike to the north. Previous drilling campaigns by Classic at Kat Gap have returned significant high-grade gold intercepts over approximately 140m of strike along the main granite-greenstone contact. The majority of the drilling is relatively shallow down to approximately 60m vertical depth below surface. The main area of drilling has been focussed primarily on and adjacent to the contacts of a cross-cutting Proterozoic dyke where it intersects the main granite-greenstone contact. At this location the gold mineralisation has been significantly enriched. Better results from this drilling include, 8m @ 19.05 g/t Au from 32m including 4m @ 28.80 g/t Au from 32m in FKGRC008; 12m @ 7.52 g/t Au from 39m including 2m @ 20.20 g/t Au from 48m in FKGRC006; 12m @ 5.39 g/t Au from 30m including 1m @ 20.80 g/t Au from 30m in FKGRC012; 10m @ 30.78 g/t Au from 28m including 2m @ 116.10 g/t Au from 31m in FKGRC018; 9m @ 8.08 g/t Au from 95m including 1m @ 62.30 g/t Au from 101m in FKGRC025; 10m @ 4.18 g/t Au from 26m including 1m @ 15.10 g/t Au from 31m in FKGRC022. Several deeper RC holes have also been drilled to approximately 120m to test the main contact zone at depth. These holes were primarily designed to test a potential plunge zone detected by the shallow RC holes. Better results from these holes include, 9m @ 8.08 g/t Au from 95m including 1m @ 62.30 g/t Au from 101m in FKGRC025 and 1m @ 18.80 g/t Au from 86m in FKGRC026. The plunge line is wide open along strike and down dip. 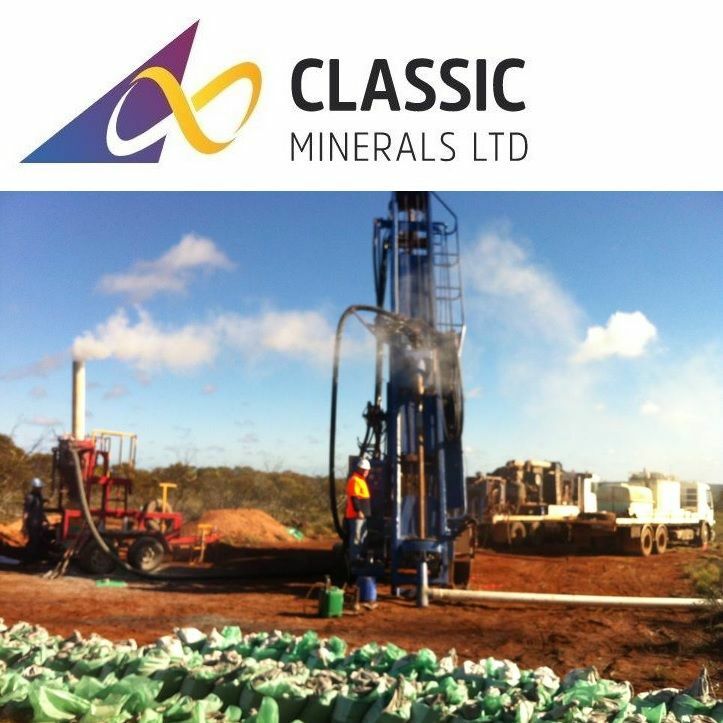 Classic has planned follow up RC and diamond holes with drilling scheduled for early in the New Year. Link: High Grade Drilling Results Continue at Kat Gap.